So far in season eleven, Doctor Who has addressed, among other things, racism, privilege, and religious persecution. When the Doctor gets a delivery mid-flight in space from a creepy looking robot, she opens up the box to find a fez and a note that says: “Help me.” It seems pretty clear that this episode is going to address the evils of billion-dollar corporations or the exploitation of workers or rogue robots. But don’t write this episode off just yet. The delivery came courtesy of Kerblam, a huge Amazon-like corporation that uses delivery robots to reach customers anywhere on a planet or in space. Team TARDIS arrives on Kerblam’s home planet and registers as new workers in a gigantic packing plant. By law, Kerblam has to maintain a 10% human workforce in all areas and Judy — the team’s tour guide — is in charge of those 10,000 human workers. The plant is experiencing regular but brief power outages that don’t seem to concern Judy but do get the Doctor’s attention. The team is split up. The Doctor and Ryan are sent to packing, where they meet Kira, a nice, soft-spoken woman who admits that a few people have gone missing recently. Graham is sent to custodial services, where he’s paired with Charlie — a nice man who provides Graham with a brief history of Kerblam and gives him a diagram of the warehouse. Yaz gets, arguably, the worse assignment. She goes to the warehouse to retrieve orders and is paired with Dan, a seasoned worker saving money to support his daughter. Could he be an indentured servant? Yaz and Dan are gently reprimanded by a teammate, one of the robot workforce, for talking instead of working. When she gets an order from deep within the warehouse, Dan insists on taking it instead. Thankfully — either because she’s a cop or because she’s been with the Doctor long enough already — Yaz is smart enough to follow Dan anyway. He encounters another teammate that seems to be malfunctioning. Then, Yaz hears him scream and all that’s left of Dan is his scanner and the necklace his daughter made him. The Doctor, Yaz, and Ryan report that Dan is missing. Judy and the manager, Mr. Slade, appear concerned but cautious about this news. Kerblam is its own jurisdiction and they’re the ones responsible for all employee welfare. That doesn’t seem ominous at all. Graham finds the group outside and they all watch as Charlie and Kira are adorably unable to talk to one another because each has a massive crush on the other. The Doctor, Ryan, and Yaz sneak back into Slade’s office after hours but are promptly caught by Judy. She’s suspicious because there’s no record of them before today. However, once the Doctor shows evidence that workers have been going missing and someone sent a “help me” message, Judy agrees to help. Almost as soon as Graham and Charlie arrive, the power goes out. A somehow still active teammate enters and attacks Charlie. He’s saved when Judy rips off the robot’s head. Yeah, she can stick around. It’s time for the team to split up again. Yaz, Ryan, and Charlie slide down a dispatch chute to get to that level in search of Kira. The others remain with the Doctor, who plugs Twirly into the Kerblam system. Fairly quickly, the robot says help is needed in dispatch and the pieces fall into place for the Doctor — a human didn’t send a “help me” message because the robots were rebelling; it’s the other way around. The robots are asking for help. Using the delivery bot’s ability to teleport, the Doctor transports herself, Graham, and Judy down to dispatch as well. Slade is there waiting for them with his gun... but twist: he’s not the villain in this story. He was suspicious of the Doctor but now sees she’s trying to help, so he joins their group. They discover a disgusting pile of goo that is the liquefied remains of the missing workers. There’s also an army of delivery bots waiting to be sent out. But every box has something different in it so how could they be a threat? Kira arrives in a small room in dispatch and a box appears with her name on it. Inside is only bubble wrap. Outside the room and unable to get in, Charlie screams for her not to do what every person does with bubble wrap. But she can’t hear him. She pops a bubble. A gas is released and Kira disappears, dead like the others. Dead like every person who receives one of the packages the army of delivery bots is holding. Ryan realizes it first: Kerblam isn’t evil or forcing its workers into servitude, and the robots aren’t attacking people at random or staging a rebellion. Charlie is behind everything. Ryan runs to the others and tells them. Charlie holds up a button to activate the army of bots and confesses. He’s angry because only 10% of the workforce is human and he believes people have been replaced by technology. So he intends to show the danger of technology by killing thousands of people using Kerblam’s own delivery bots, making it appear that they have malfunctioned or gone rogue. But Kerblam’s system has been fighting him the entire time, sending a message to the Doctor, trying to kill him in Slade’s office, and even taking Kira in the hopes that Charlie’s affection for her would stop him from going through with his plan. But he presses the button anyway, then smashes it on the ground. 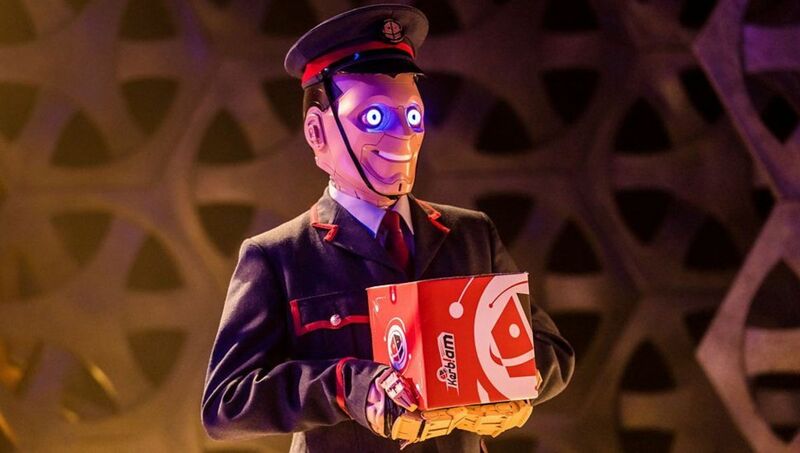 Working quickly, the Doctor uses Twirly to change the delivery instructions for Charlie’s bots. She sets them to deliver their boxes to themselves and to pop the bubble wrap right where they are in dispatch. She and Graham both call out to Charlie to leave with them but he runs among the bots and dies when they explode. The Doctor teleports everyone else away safely. In the aftermath, Judy says she and Slade will explore including more people in Kerblam’s operations. Remembering Dan’s kindness, Yaz requests they stop off to see his daughter so she can return his necklace to her. There’s a clear theme this season of people and their hatred being the enemy rather than monsters or killer aliens. I like this theme but after seven episodes of it, I have to say it’s starting to feel a little old. “Kerblam!” is the first time this season we’ve seen the villain of the story face any consequences for his actions. If everything ties together into a larger arc by the season’s end, I’m prepared to take this criticism back. But as it stands right now, I’m ready for a more old-fashioned Doctor Who episode. I’m glad the show continues to mention Ryan’s dyspraxia and how it affects his ability to do things like jump down a chute or leap onto moving conveyor belts. A lot of other shows might’ve made a big deal about it once and then forgotten about it but there’s obviously conscious thought going into how someone with dyspraxia would approach the adventures in the TARDIS. I know the fez is a ~thing~ in Doctor Who but I never particularly cared for it. However, Thirteen in the fez with her rolled up pants was a ridiculous and fantastic look.